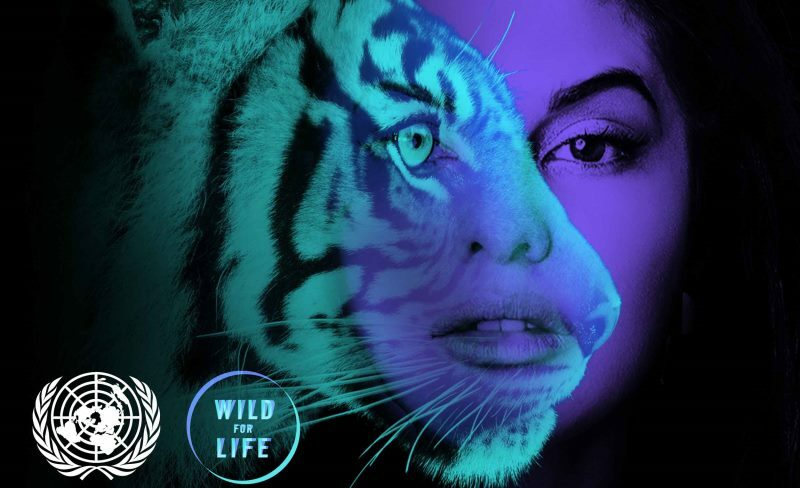 #WildforLife was launched at the United Nations Environment Assembly (UNEA-2) in Nairobi in front of environment ministers from every corner of the planet. The campaign aims to mobilize millions of people to make commitments and take action to end the illegal trade. The campaign is run by the United Nations Environment Programme (UNEP), the UN Development Programme (UNDP), the UN Office on Drugs and Crime (UNODC) and the Convention on International Trade in Endangered Species of Wild Fauna and Flora (CITES) and is supported by Global Environment Facility (GEF) and World Bank. Highlighting the need for citizens of the world to act now, United Nations Secretary General Ban-Ki-moon stated, “Each year, thousands of wild animals are illegally killed, often by organized criminal networks motivated by profit and greed. Speaking about her motivation to join the campaign, Jacqueline Fernandez emphasized how kids rooms all across the globe are filled with stuffed likenesses of these iconic species. “Wouldn’t it be tragic to know they disappeared in our lifetime? The illegal trade in wildlife is threatening these majestic beasts, and we have to join forces to stop it. Today, I am giving my name to change the game for tigers. Join me and do something amazing,” she urged. Ms. Fernandez is being joined by major celebrities from China, Indonesia, Lebanon and Viet Nam battling to conserve species such as orangutans, tigers, rhinos and helmeted hornbills and calling for citizen support to end the demand that is driving the illegal trade. 100,000 African elephants were killed in 2010-2012, out of a population estimated at less than 500,000. An estimated 170 tonnes of ivory was illegally exported out of Africa between 2009 and 2014. With over one million animals taken from the wild in the past decade, pangolins are the most illegally trafficked mammal in the world. Illegal trade in wildlife and natural resources is valued at up to $213 billion annually, compared to $120 billion of official development assistance. According to the Thin Green Line, over the last decade, over 1,000 park rangers have been killed in the line of duty. 40% of all intrastate conflicts in the last 60 years were linked to natural resources and over 80% of major armed conflicts in the last 50 years occurred in biodiversity hotspots. What is equally alarming is the fact that profits from the illegal wildlife trade sometimes go into the pockets of international criminal networks, threatening peace and security, and damaging the livelihoods of local communities who depend on tourism. People around the world are supporting this campaign in whatever way they can. Steppenwolf’s lead singer, John Kay for instance, has donated the use of Born to Be Wild – one of the top three international music licenses of all time for Universal Music – to the campaign. Its your turn now to contribute! The campaign asks participants to find their kindred species and use their own spheres of influence to end the illegal trade, however it touches or impacts them.